LifeWay Christian Resources has stopped selling all "experiential testimonies about heaven" following consideration of a 2014 Southern Baptist Convention resolution on "the sufficiency of Scripture regarding the afterlife." 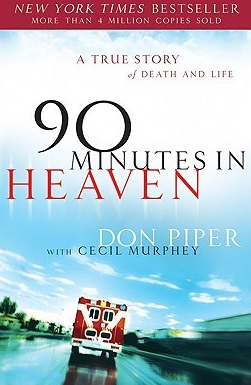 LifeWay told Baptist Press about its decision to halt sales of heaven visitation resources today (March 24) in response to an inquiry about the book "90 Minutes in Heaven" by Don Piper, which is being made into a movie slated for release this fall. The book recounts Piper's supposed experience of heaven following a severe auto accident and has sold 6.5 million copies in 46 languages. "Last summer, as we began developing LifeWay's new structure and direction -- what we've now identified as One LifeWay -- the role of heaven visitation resources was included in our considerations. We decided these experiential testimonies about heaven would not be a part of our new direction, so we stopped re-ordering them for our stores last summer," LifeWay spokesman Marty King told Baptist Press in written comments. "Now that we've begun implementing the new direction, the remaining heaven visitation items have been removed from our stores and website and will not be replenished. We have more work to do aligning the LifeWay Retail Division with LifeWay's vision and core values so we covet your prayers as we continue to provide trustworthy Biblical Solutions for Life," King said. Though LifeWay "was not mentioned in the SBC resolution affirming the sufficiency of biblical revelation and affirming the truth about heaven and hell," King told BP in an interview, "the resolution was approved overwhelmingly and was considered during our process." The resolution, adopted by messengers to the SBC annual meeting in June, warned Christians not to allow "the numerous books and movies purporting to explain or describe the afterlife experience" to "become their source and basis for an understanding of the afterlife." The resolution did not list specific book or movie titles, but it seemed to describe works like "90 Minutes in Heaven," "The Boy Who Came Back from Heaven" by Kevin and Alex Malarkey and "Heaven Is for Real" by Todd Burpo along with its companion movie released last year by Sony Pictures. The resolution affirmed "the sufficiency of biblical revelation over subjective experiential explanations to guide one's understanding of the truth about heaven and hell." In January, LifeWay announced it would stop selling "The Boy Who Came Back from Heaven" after coauthor Alex Malarkey admitted that he lied about having a vision of heaven as a 6-year-old. See related BP story. At the time, King said LifeWay was "committed to becoming even more proactive in the next few months in evaluating the resources we carry." Giving Films announced the completion of filming for "90 Minutes in Heaven" March 12. The movie stars Hayden Christensen of "Star Wars" and Kate Bosworth of "Superman Returns." The film also features veteran actor and former U.S. Senator Fred Thompson as well as singers Michael W. Smith and Dwight Yoakam, according to a news release from Giving Films. "I'm an ordinary man with an extraordinary story," Piper said according to the news release. "I want people to see hope in their challenges, to see that pain can come with purpose." Why we're seeing "Mantle Madness"